“Through Imperial Eyes,” the latest episode of Star Wars Rebels, was intense. 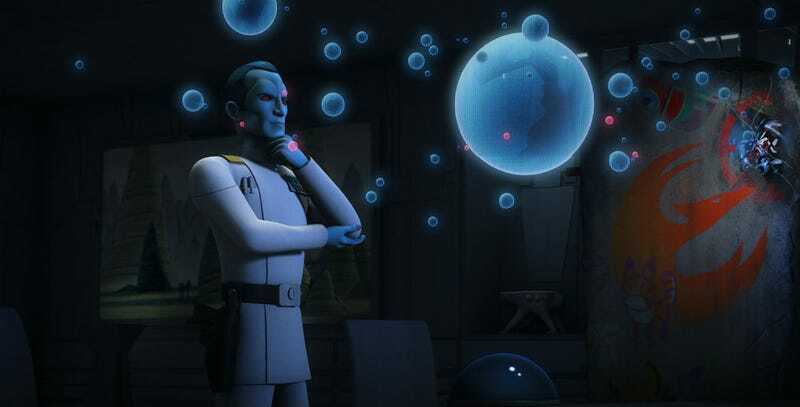 Grand Admiral Thrawn began to uncover the identity of the Rebel spy Fulcrum and Ezra and Agent Kallus did their best to stop him. The episode also showed us that Thrawn is great at uncovering other things too. Just look around his office. As good an episode as it was, the design of Thrawn’s office is even better. It’s filled with all kind of Easter eggs including links to other Star Wars films, Lucasfilm properties, and even Rebels history. Let’s start with the most exciting one. Rebels art director Kilian Plunkett confirmed that in the chamber leading to Thrawn’s office is the Holy Grail from Indiana Jones and the Last Crusade (which we’re hoping makes this infamous piece Star Wars trivia canon). Here’s the long shot and a close-up. Thrawn also has a Clone helmet that looks a lot like Gree’s, a Clone Trooper who was decapitated by Yoda on Kashyyyk in Revenge of the Sith. How Thrawn would get that is beyond us, but we’d love to hear the story. Next, he has a bust of an abednedo, which is a species popularized by Force Awakens pilot and Beastie Boys fan Ello Asty. And finally, a painting on the wall is actually just a digital recreation of a work by legendary Star Wars artist Ralph McQuarrie, which was used by the Rebels crew to create the main planet of Lothal. Here’s the painting, then the shot from the episode. But that’s not all. Twice in the episode, Thrawn has to battle assassin droids and stop them with an override code. Lucasfilm confirmed to io9 that the word is “Rukh,” as in the character from the EU who ended up assassinating Thrawn. Executive producer Dave Filoni put it in as a wink to EU fans because, well, it was the assassin droid. Plus, Thrawn’s ship in this episode, the Chimaera, is the same name of his ship in the EU. And then, of course, there’s the obvious stuff. He’s got a piece of artwork by Sabine as well as Hera’s famil kalikori in his office, nods to his current task of finding the Rebels. But those aren’t Easter eggs because they’re directly referenced and part of the story. You can find out more about Rebels on the weekly YouTube show, Rebels Recon, linked below. Update: We updated the information on “Rukh” with confirmation from Lucasfilm. The first version of the story only speculated.